How Making-Dreadlocks.com came to be……..
Making-Dreadlocks.com started in 2002 when I first started my dreadocks journey. I talked to many people locally who were locked up but they never had good information about the way to start them. I heard “just don’t brush your hair…” or “put mud in your hair and it will lock.”. This was definitely not my style. So I came to the internet looking for a way to lock my hair. I found a few sites about starting dreadlocks but no one seemed to have any opinions about the methods and no one had any information on taking care of your dreadlocks after you’ve had them. I also found dreadlocks message boards where people with dreads were ranting about stuff that had nothing to do with dreadlocks. 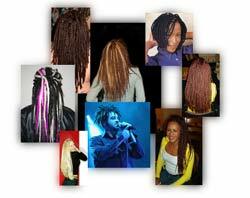 I was not convinced there was valuable information on the internet about making dreadlocks. And then it hit me, Making-dreadlocks.com. This site is a way for me to help people who want to lock up and want good information from the beginning. This site is setup with information for everyone, regardless of their background. I plan to setup a dreadlocks community with a product reviews section, dreadlocks pictures page with information and tips about how each person started their dreadlocks, and monthly newsletter with dreadlocks tips and maybe even contest and giveaways. I might even create a dreadlocks chat. I hope you enjoy!